Cham tradition claims that the founder of the Cham state was Lady Po Nagar. She originated from Khanh Hoa province, in a peasant family in the mountains of Dai An. Spirits assisted her when she sailed on a drift piece of sandalwood to China, where she married a Chinese crown prince, the son of the Emperor of China, with whom she had two children, and then became Queen of Champa. When she returned to Champa to visit her family, the Prince refused to let her go, but she flung the sandalwood into the ocean, disappeared with her children and reappeared at Nha Trang to her family. When the Chinese prince tried to follow her back to Nha Trang, she was furious, and turned him and his fleet into stone. The Sa Huynh culture was a late prehistoric metal age society on the central coast of Viet Nam. In 1909, about 200 jar burials were uncovered at Sa Huynh, a coastal village located south of Da Nang. Since then, many more burials have been found, at some 50 sites. The Sa Huynh shows a distinct regional Bronze Age culture, with its own styles of axes, daggers, and ornaments. Carbon dating has placed the Sa Huynh culture at roughly the same time as the Dong Son culture, that is, about the first millennium BC. From about 200 AD, the central coast of Viet Nam was inhabited by the Chams, who had adopted elements of Indian political and religious culture. Recent researches by Vietnamese archaeologists have shown that the Chams were linguistic and cultural descendants of the Sa Huynh people. The artifacts show that the Sa Huynh people were highly skilled craftsmen in the production of jewelry and ornaments made with hard stones and glass. Sa Huynh styled ornaments were also found in Thailand, Taiwan and Philippines suggesting they were traded with South East Asian neighbors, over land and maritime routes. Archaeologists also observe that iron seems to have been used by the Sa Huynh peoples when their Dong Son neighbors were still mostly using bronze. The towers of Po Sa Nu (Pho Hai) near Phan Thiết may be the oldest extant Cham buildings. In style, they exhibit the influence of pre-Angkorian Cambodia. To the Chinese, the country of Champa was known as 林邑 Linyi in Mandarin and Lam Yap in Cantonese and to the Vietnamese, Lâm Ấp (which is the Sino-Vietnamese pronunciation of 林邑). It had been founded in 192 AD in the region of modern Huế by Khu Lien, a local leader rebelling against the Han Dynasty. Over the next several centuries, Han forces made repeated unsuccessful attempts to retake the region. From its neighbor Funan to the west, Lâm Ấp soon received the gift of Indian civilization. Scholars locate the historical beginnings of Champa in the 4th century, when the process of Indianization was well underway. It was in this period that the Cham people began to create stone inscriptions in both Sanskrit and in their own language, for which they created a unique script. The first king acknowledged in the inscriptions is Bhadravarman, who reigned from 380 to 413 AD. At Mỹ Sơn, King Bhadravarman established a god named Bhadresvara, whose name was a combination of the king's own name and that of the Hindu god of gods Shiva.The worship of the original god-king under the name Bhadresvara and other names continued through the centuries that followed. The capital of Lâm Ấp at the time of Bhadravarman was the citadel of Simhapura ("Lion City", not to be confused with Singapore which shares similar pronunciation and etymology), which was located along two rivers and had a wall eight miles in circumference. A Chinese writer described the people of Lâm Ấp as both warlike and musical, with "deep eyes, a high straight nose, and curly black hair." According to Chinese records, Sambhuvarman (Fan Fan Tche) was crowned king of Lâm Ấp in 529 AD. Inscriptions credit him with rehabilitating the temple to Bhadresvara after a fire. Sambhuvarman also sent delegations and tribute to China, and unsuccessfully invaded what is now northern Vietnam. The Chinese sent General Pham Tu to pacify the Chams after they raided Vietnam, which was part of China in 543, the Chams were defeated. In 605 AD, a general Liu Fang (劉方) of the Chinese Sui dynasty invaded Lâm Ấp, won a battle by luring the enemy war-elephants into an area booby-trapped with camouflaged pits, massacred the defeated troops, and captured the capital.In the 620s, the kings of Lâm Ấp sent delegations to the court of the recently established Tang Dynasty and asked to become vassals of the Chinese court. Chinese records report the death of the last king of Lâm Ấp as falling in 756 AD. Thereafter for a time, the Chinese referred to Champa as "Hoan Vuong" or "Huanwang".The earliest Chinese records using a name related to "Champa" are dated 877 AD; however, such names had been in use by the Cham themselves since at least 629 AD, and by the Khmer since at least 657 AD. From the 7th to the 10th centuries, the Cham controlled the trade in spices and silk between China, India, the Indonesian islands, and the Abbassid empire in Baghdad. They supplemented their income from the trade routes not only by exporting ivory and aloe, but also by engaging in piracy and raiding. By the second half of the 7th century AD, royal temples were beginning to make their appearance at Mỹ Sơn. The dominant religious cult was that of the Hindu god Shiva, but temples were also dedicated to Vishnu. Scholars have called the architectural style of this period Mỹ Sơn E1, in reference to a particular edifice at Mỹ Sơn that is regarded as emblematic of the style. Important surviving works of art in this style include a pedestal for a linga that has come to be known as the Mỹ Sơn E1 Pedestal and a pediment depicting the birth of Brahma from a lotus issuing from the navel of the sleeping Vishnu. In an important stone inscription dated 657 AD. and found at Mỹ Sơn, King Prakasadharma, who took on the name Vikrantavarman I at his coronation, claimed to be descended through his mother from the Brahman Kaundinya and the serpent princess Soma, the legendary ancestors of the Khmer of Cambodia. This inscription thus underlines the ethnic and cultural connection of Champa with the Khmer Empire, its perennial rival to the west. It also commemorates the king's dedication of a monument, probably a linga, to Shiva. Another inscription documents the king's almost mystical devotion to Shiva, "who is the source of the supreme end of life, difficult to attain; whose true nature is beyond the domain of thought and speech, yet whose image, identical with the universe, is manifested by his forms." In the 8th century, during the time when the Chinese knew the country as "Huanwang", the political center of Champa shifted temporarily from Mỹ Sơn southward to the regions of Panduranga and Kauthara, centered around the temple complex of Po Nagar near modern Nha Trang that was dedicated to the indigenous Earth goddess Yan Po Nagar. In 774 AD. raiders from Java disembarked in Kauthara, burned the temple of Po Nagar, and carried off the image of Shiva. The Cham king Satyavarman pursued the raiders and defeated them in a naval battle. In 781 AD, Satyavarman erected a stele at Po Nagar, declaring that he had regained control of the area and had restored the temple. In 787 AD, Javanese raiders destroyed a temple dedicated to Shiva near Panduranga. In 875 AD, King Indravarman II founded a new northern dynasty at Indrapura (Dong Duong near Da Nang in modern Vietnam). Eager to claim an ancient lineage, Indravarman declared himself the descendant of Bhrigu, the venerable sage whose exploits are detailed in the Mahabharata, and asserted that Indrapura had been founded by the same Bhrigu in ancient times. [ From 877 onward, the Chinese knew Champa as "Cheng-cheng", discontinuing their use of the term "Huan-wang." Kings belonging to the dynasty of Indrapura built a number of temples at Mỹ Sơn in the 9th and 10th centuries. Their temples at Mỹ Sơn came to define a new architectural and artistic style, called by scholars the Mỹ Sơn A1 Style, again in reference to a particular foundation at Mỹ Sơn regarded emblematic for the style. With the religious shift from Buddhism back to Shaivism around the beginning of the 10th century, the center of Cham religion also shifted from Dong Duong back to Mỹ Sơn. Champa reached its peak in the civilization of Indrapura centered in the region of Dong Duong and Mỹ Sơn. Factors contributing to the decline of Champa over the next several centuries include its enviable position along the trade routes, its relatively small population base, and its frequently antagonistic relations with its closest neighbors: the Viet to the north and the Khmer to the west. Interesting parallels may be observed between the history of northern Champa (Indrapura and Vijaya) and that of its neighbor and rival to the west, the Khmer civilization of Angkor, located just to the north of the great lake Tonlé Sap in what is now Cambodia. The foundation of the Cham dynasty at Indrapura in 875 AD. was followed just two years later by the foundation at Roluos in 877 of the Khmer empire by King Indravarman I, who united two previously independent regions of Cambodia. The parallels continued as the two peoples flourished from the 10th through the 12th centuries, then went into gradual decline, suffering their ultimate defeat in the 15th century. In 1238, the Khmer lost control of their western possessions around Sukhothai as the result of a Thai revolt. The successful revolt not only ushered in the era of Thai independence, but also foreshadowed the eventual abandonment of Angkor in 1431 AD. following its sack by Thai invaders from the kingdom of Ayutthaya, which had absorbed Sukhothai in 1376. The decline of Champa was roughly contemporaneous with that of Angkor, and was precipitated by pressure from the Đại Việt of what is now northern Vietnam, culminating in the conquest and obliteration of Vijaya in 1471 AD. According to the Daoyi Zhilue documents, around the 11th century Chinese merchants who went to Cham ports in Champa married Cham women, to whom they regularly returned after trading voyages. A Chinese merchant from Quanzhou, Wang Yuanmao, traded extensively with Champa, and married a Cham princess. In 944 and 945 AD, Khmer troops from Cambodia invaded the region of Kauthara. 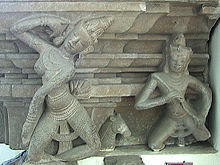 Around 950, the Khmer pillaged the temple of Po Nagar and carried off the statue of the goddess. In 960, the Cham King Jaya Indravaman I sent a delegation with tribute to the first king of the Chinese Song Dynasty, which had been established in Kaifeng around 960. In 965, the king restored the temple at Po Nagar and reconstructed the statue of the goddess to replace the one stolen by the Khmer. In the latter half 10th century, the kings of Indrapura waged war against the Đại Việt of what is now northern Vietnam. The Viet had spent the better part of the century securing their independence from Chinese rule. Following the defeat of the Chinese fleet by Ngô Quyền in the Battle of Bạch Đằng in 938 AD, the country had gone through a period of internal turmoil until its final reunification by the Đinh Dynasty in 968 under the name Dai Co Viet, and the establishment of a capital at Hoa Lu near modern Hanoi. Closeup of the inscription in Cham script on the Po Nagar stele, 965 CE. The stele describes feats by the Champa kings. In 979 AD, the Cham King Parameshvaravarman I (Phê Mi Thuê to the Viet) sent a fleet to attack Hoa Lu. The ill-fated expedition was however scuttled by a tempest. In 982, King Lê Hoàn of the Đại Việt sent three ambassadors to Indrapura. When the ambassadors were detained, Lê Hoàn decided to go on the offensive. Viet troops sacked Indrapura and killed King Phê Mi Thuê. They carried off Cham dancers and musicians who subsequently came to influence the development of the arts in Đại Việt. As a result of these setbacks, the Cham abandoned Indrapura around 1000 AD. The center of Champa was relocated south to Vijaya in modern Binh Dinh. Several Chinese accounts record Cham arriving on Hainan. When the Cham capital fell in 982 to Vietnam, several Cham fled to Hainan during the Song dynasty. After the fall of the capital Indrapura, some Cham fled to Guangzhou in addition to Hainan. They became ancestors of the modern day Utsuls on Hainan, who are Muslims and still speak a Cham language. While declaring himself an independent ruler to his own people, the Vietnamese leader Dinh Bo Linh requested only officially the status of his domain as neifu from the Chinese, which was not an independent state but of an autonomous suboordinate region of China. After this, Champa also demanded this status, to be officially part of China, sending large amounts of tribute to the Chinese. When Vietnam sent Cham prisoners to China, the Chinese sent them back to Champa. Conflict between Champa and Đại Việt did not end, however, with the abandonment of Indrapura. Champa suffered further Viet attacks in 1021 and 1026 AD. In 1044 AD, a catastrophic battle resulted in the death of the Cham King Sa Dau and the sack of Vijaya by the Đại Việt under Lý Thái Tông. The invaders captured elephants and musicians and even the Cham queen Mi E, who preserved her honor by throwing herself into the waves as her captors attempted to transport her to their country. 30,000 Cham were killed.Champa began to pay tribute to the Viet kings, including a white rhino sent in 1065. In 1068 AD, however, the King of Vijaya Rudravarman (Che Cu) attacked Đại Việt in order to reverse the setbacks of 1044. Again the Cham were defeated, and again the Đại Việt captured and burned Vijaya. These events were repeated in 1069, when the Viet general Ly Thuong Kiet took a fleet to Champa and occupied Vijaya. Rudravarman and 50,000 others were taken into captivity, eventually purchasing his freedom in exchange for three northern districts of his realm.Taking advantage of the debacle, a leader in southern Champa rebelled and established an independent kingdom. The northern kings were not able to reunite the country until 1084. In 1074 AD, King Harivarman IV took the throne, restoring the temples at Mỹ Sơn and ushering in a period of relative prosperity. Harivarman made peace with the Đại Việt, but provoked war with the Khmer of Angkor. In 1080, a Khmer army attacked Vijaya and other centers in northern Champa. Temples and monasteries were sacked; cultural treasures were carried off. After much misery, Cham troops under King Harivarman were able to defeat the invaders and restored the capital and temples. Around 1080 AD, a new dynasty from the Korat Plateau in modern Thailand occupied the throne of Angkor in Cambodia. Soon enough, the kings of the new dynasty embarked on a program of empire-building. Rebuffed in their attempts to conquer Đại Việt in the 1130s, they turned their attention to Champa. In 1145 AD, a Khmer army under King Suryavarman II, the founder of Angkor Wat, occupied Vijaya and destroyed the temples at Mỹ Sơn. The Khmer king then proceeded to attempt the conquest of all of northern Champa. In 1149 AD, however, the ruler of the southern principality of Panduranga, King Jaya Harivarman, defeated the invaders and had himself consecrated king of kings in Vijaya. He spent the rest of his reign putting down rebellions in Amaravati and Panduranga. This bas relief at the late 12th century Angkorian temple called the Bayon depicts Cham mariners in action against the Khmer. In 1167 AD, King Jaya Indravarman IV ascended to the throne in Champa. An inscription characterized him as brave, well-versed in weapons, and knowledgeable of philosophy, Mahayana theories and the Dharmasutra. After securing peace with the Đại Việt in 1170, Jaya Indravarman invaded Cambodia with inconclusive results. In 1177, however, his troops launched a surprise attack against the Khmer capital of Yasodharapura from warships piloted up the Mekong River to the great lake Tonlé Sap in Cambodia. The invaders sacked the capital, killed the Khmer king, and made off with much booty. The Khmer were rallied by a new king, Jayavarman VII, who drove the Cham from Cambodia in 1181 AD. When Jaya Indravarman IV launched another attack against Cambodia in 1190, Jayavarman VII appointed a Cham prince named Vidyanandana to lead the Khmer army. Vidyanandana defeated the invaders and proceeded to occupy Vijaya and to capture Jaya Indravarman, whom he sent back to Angkor as a prisoner. Following the conquest of Vijaya, the Khmer king installed his own brother-in-law, Prince In, as a puppet king in Champa. Civil war broke out, however, between several factions. In the end, Prince In prevailed, but declared his independence from Cambodia. Khmer troops attempted unsuccessfully to regain control over Champa throughout the 1190s. In 1203 AD, finally, Jayavarman VII's generals took Vijaya, and Champa effectively became a province of Angkor, not to regain its independence until 1220.Thereafter, Vijaya went into a period of gradual decline that lasted for more than two centuries. This period ended in a total defeat at the hands of the Đại Việt, and was briefly interrupted by a period of astounding military success under the warrior king Chế Bồng Nga. When the Chinese Song dynasty fell to the Mongols, its loyalists fled to Champa where they plotted the reconquest of China. In 1283 AD, Mongol troops of the Yuan Dynasty under General Sogetu (Sodu) invaded Champa and occupied Vijaya. In the 1270s, Kublai Khan had established his capital and dynasty at Beijing and had toppled the southern Chinese Song Dynasty. By 1280, he would turn his attention to the Cham and Viet kingdoms located in the territory of modern Vietnam. A series of Mongol assaults on Đại Việt were, however, unsuccessful, resulting in severe setbacks such as the Battle of Bạch Đằng. Similarly, the invasion of Champa had little lasting effect. Rather than engage the invaders directly, the Cham king and his troops retreated from the coast to the mountains and fought as guerrillas. Two years later, the Mongols left of their own accord. Sogetu was soon killed in another botched invasion of Đại Việt.However, the Champa accepted the Mongol suzerainty 3 years later. In 1307 AD, the Cham King Jaya Simhavarman III (Che Man), the founder of the still extant temple of Po Klaung Garai in Panduranga, ceded two northern districts to the Đại Việt in exchange for the hand in marriage of a Viet princess. Not long after the nuptials, the king died, and the princess returned to her northern home in order to avoid a Cham custom that would have required her to join her husband in death. However, the lands that Che Man had rashly ceded were not returned. In order to regain these lands, and encouraged by the decline of Đại Việt in the course of the 14th century, the troops of Champa began to make regular incursions into the territory of their neighbor to the north. The last strong king of the Cham was Chế Bồng Nga or Che Bunga, who ruled from 1360 until 1390. In Vietnamese stories he is called The Red King. Chế Bồng Nga apparently managed to unite the Cham lands under his rule and by 1372 he was strong enough to attack and almost conquer Đại Việt from the sea. Cham forces sacked Thăng Long, the capital city of Đại Việt located at the site of modern Hanoi, in 1372 and then again in 1377. A last attack in 1388 was checked by the Vietnamese General Hồ Quý Ly, future founder of the Hồ Dynasty. Chế Bồng Nga died two years later in 1390. This was the last serious offensive by the Cham against Đại Việt, but it helped spell the end of the Trần Dynasty, which had forged its reputation in the wars against the Mongols a century earlier, but which now revealed itself as weak and ineffective in the face of the Cham invasions. In 1446, the Đại Việt under the leadership of Trịnh Khả launched an invasion of Champa. The attack was successful and Vijaya fell to the invaders. A year later, however, a counter-attack drove the Viet from the city. In 1470, the Đại Việt, led by the emperor Lê Thánh Tông, an extraordinary administrator and leader, again invaded Champa. The Đại Việt army at that time was well organized and had large numbers of gunpowder weapons. By contrast the Cham were particularly vulnerable to gun warfare. Vijaya was captured after four days of fighting on 21 March 1471. The Cham king Tra-Toan (Pau Kubah) was captured and died not long thereafter, though he sent his son Syah Pau Ling to Aceh and began a new dynasty there, and another son Syah Indera Berman to Melaka. According to linguistic study Acehnese people of northern Sumatra and Cham are related through the Aceh–Chamic languages. At least 60,000 Cham people were killed and 30,000 were taken as slaves by the Vietnamese army. The capital of Vijaya was obliterated. As a result of the victory, Lê Thánh Tông annexed the principalities of Amaravati and Vijaya. This defeat caused the first major Cham emigration, particularly to Cambodia and Malacca. Those who emigrated to Hainan would become known as the Utsul. What remained of historical Champa was the southern principality of Panduranga. Under the protection of Dai-Viet, it preserved some of its independence. This was the starting point of the modern Cham Lords in the principality of Panduranga (Phan Rang, Phan Ri and Phan Thiết). In 1594 the Cham Lord Po At sent forces to assist the Sultanate of Johor's attack on Portuguese Malacca. When the Ming dynasty in China fell, Chinese refugees fled south and extensively settled on Cham lands and in Cambodia. [ Most of these Chinese were young men, and they took Cham women as wives. Their children identified more with Chinese culture. This migration occurred in the 17th and 18th centuries. In 1692, the Cham Lord Po Sot rebelled against Nguyễn Phúc Trăn who ruled southern Vietnam. The revolt was at first unsuccessful and the aftermath was exacerbated by an outbreak of plague in Panduranga. However, a Cham aristocrat Oknha Dat obtained the help of the general A Ban, a Lauw. [clarification needed] leader. They were defeated by the Nguyễn forces of Lord Nguyễn Phúc Chu, under General Nguyễn Hữu Cảnh in 1695. After defeated, the new king Po Saktiray Da Patih (younger brother of Po Sot) signed a peace treaty with Nguyễn Phuc Chu. As a result of the treaty, the Cham lords were called Trấn Vương (local lord) of Thuận Thành (Panduranga) by the Nguyễn Lords, and they were closely supervised by Nguyễn officials. Although the Cham lords had authority over the Cham people, the Panduranga archives supplied some evidence of their limited authority over Vietnamese settlers. The Cham lords often played the role of the judge for Kinh-Cham conflict cases. 17 years later, in 1712, the Nguyễn Lord Nguyễn Phúc Chu made a new treaty called "the treaty with 5 articles" (Ngũ điều Nghị định) with the Cham Lord Po Saktiray Da Patih and clarified the right (included the trial right of the Cham lords and Cham people) and the obligation of the Cham Lords and the Nguyễn Lords. This new treaty was kept until 1832 by the Cham Lords, Nguyễn Lords, Tây Sơn Lords and Nguyễn Emperors. In 1796, during the last years of the Tây Sơn, Tuen Phaow, a noble from Makah (Kelantan), headed a major revolt against the new Cham leaders (Po Ladhwan Paghuh, Po Chơng Chơn and Po Klan Thu) and claimed Kelantan's support but the revolt was defeated. The Cham leaders regained their special rights once Nguyễn Ánh (the Emperor Gia Long) regained control over Vietnam in 1802. But even the limited Cham rule in Panduranga officially came to an end in 1832, when the Emperor Minh Mạng annexed the area.